Unemployment, underemployment, foreclosures, disappearing nest eggs — millions of Americans are facing crushing economic woes. Does faith really help in hard times? 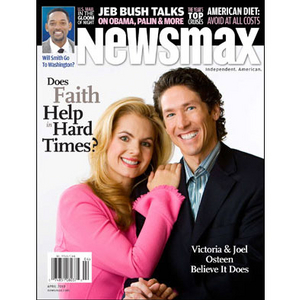 Joel and Victoria Osteen believe it does. The Osteens are pastors of the nation's largest single congregation, with weekly attendance of about 45,000 at their Lakewood Church in Houston, and Joel Osteen's weekly TV program reaches a television audience of some 7 million a week in the U.S. alone. Their improbable achievement, they say, comes from trusting in God's desire that they thrive. And they believe the same kind of success can be had by those who follow God's plan, even when the going gets tough. "You can't have faith if you don't first have hope," Joel tells Newsmax in an exclusive interview. "When you have that hope, it allows God to do great things." Newsmax magazine's special report, "Faith and Prosperity in a Time of Trouble," takes an in-depth look at religion in America and particularly the Osteens' uplifting message of hope, faith, and trust in God. Does the down economy draw people closer to God? Dealing with the economy: "Don't just survive, thrive!" Secular and faith-based approaches - what's best for solving ills? Fondly remembered: Gen. Alexander Haig Jr.
Should the U.S. Postal Service be scrapped? India issuing 1.2 billion ID cards, coming soon here? Is Will Smith going to Washington? Your home is not an investment! 2010 April Magazine - Does Faith Help in Hard Times?